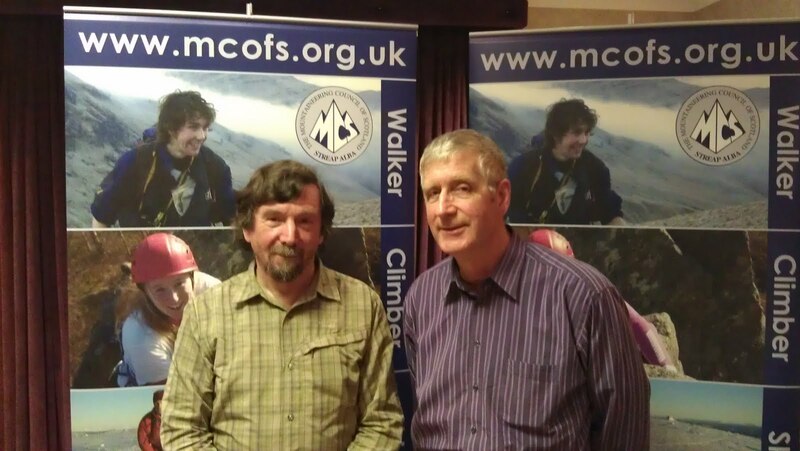 Myself with Brian Linington at the MCofS AGM last weekend. Photo: Mike Dales. For the past four years I have served as President of the Mountaineering Council of Scotland. My time in this office ended last weekend at the MCofS AGM and Brian Linington has been elected as the new President. (See news item on the MCofS site, with comments from Brian). Brian has been an MCofS Board member for several years and I'm sure that he will make an excellent President. I wish him all the best. For myself standing down as President will free up some time and mean far fewer long drives to Perth for meetings and far fewer lengthy documents to peruse. My email inbox will shrink too! I will still be involved with the MCofS as I'm remaining a member of the Access and Conservation Advisory Group. I am pleased to see that Brian says "a key challenge for me and for the MCofS – and for the many that simply enjoy the landscape of Scotland for its recreational value, or who gain a sense of well-being from the mountains – is the enormous threat to the mountain landscape from developers". Well done Chris on four good years. There is still a great deal of work to do to prevent the Highlands becoming one huge energy plant. Thanks for all your work, Chris. That's a nice photo of you Chris. Will you still be involved with Mcofs? oops! now you know I don't always read the blogs properly. I now know you will still be involved with Mcofs. Chris, I reckon you'll miss the adrenaline rush of the A93 in a heavy snowstorm.